In the beginning Pascal finds a red balloon and gets it. He went to go on the bus, but they wouldn't let him. The next day the balloon tries to follow Pascal in to the school, it got so loud the principal had to come out. Pascal got in trouble for bringing the balloon to school. 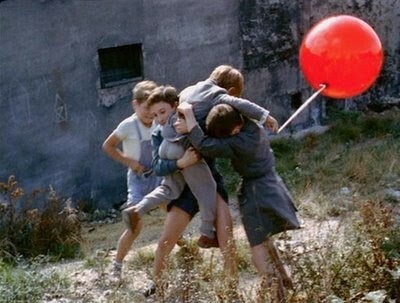 In the end when Pascal is going home the tough neighborhood boys stole the balloon. When Pascal went in the bakery shop the neighborhood boys got the balloon and they wanted to pop it. 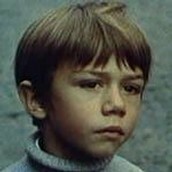 This is Pascal from The Red Balloon. 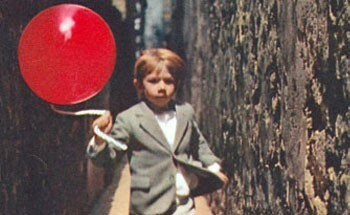 He is kind to the balloon. This is the balloon from The Red Balloon. He is Pascal's best friend.